Synopsis: JJ, Martin, Jess and Maureen meet on the top of Topper House on New Year’s Eve. They all have the same intention. To jump. Instead, they decide to give it until Valentine’s to see if life is really worth living. Time on Shelf: About 6 years. I loved High Fidelity but since then, I’ve liked each Hornby novel a little less so I avoided reading this one. I suppose it’s inevitable that a novel with such a high concept storyline would seem a little unreal at times. Each story emphasised different aspects of depression and reasons why someone might try to kill themselves. However, all four of them together on one roof was a little much and was hard to swallow. Of course, it was apparent that they wouldn’t jump – otherwise it would have been a very short story indeed – but the narrative tension was in whether they would actually make it back to life. This was where the problems started for me. I wasn’t really drawn in enough by the characters’ stories. They were all a bit too much like characters and not like real people. Martin was the fallen celebrity who only had his own stupidity to blame, Jess had a missing sister and parents who didn’t seem to really see her, Maureen had a disabled son who she had to care for 24/7 and JJ’s band had split up and he had lost his girlfriend. When it came down to it, the solutions to all their problems were quite simple but of course, when you are depressed, nothing is simple and Hornby does capture that aspect quite well. What was more difficult was liking or empathising with them. I didn’t care enough about them because they didn’t seem real. I also found the constant switching of viewpoints a little annoying. I’d have been happier if each narrator spoke for longer, I think but as it was, it was hard to get to grips with any of their voices. It was a little like being shouted at by four incredibly needy people. At times I just wanted them to shut up. 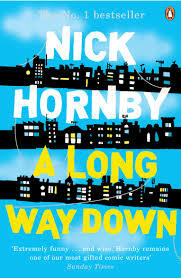 Although this is a book about depression, it is at times very funny and Hornby is very good at capturing his characters’ foibles. There are some very funny set pieces which, although they didn’t always ring true, did make me chuckle. At least there was no pat ending. Hornby realises that there is no straightforward cure for what ails these characters and so although they seem better, they are not cured. But it does seem that they are moving in the right direction. That was satisfying.